A church is mentioned here in Domesday Book. 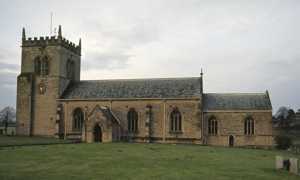 The current building is of stone, and it consists of a chancel, a nave of six bays, north aisle, south porch and an embattled western tower with pinnacles, containing a clock and six bells. The nave of c1200 is unusually long and the overall length of the church is 145 feet. The arcade varies in design from circular piers, then two quatrefoil and others octagonal; the arches are all semi-circular and double-chamfered. The upper stage of the tower is ashlar with mid 13th century two-light windows. All other windows are Perpendicular. The glass in one of them in the nave is by Kempe & Co. The south doorway is a fine example of Norman work, and the south porch appears to be Early English. These are the architectural gems of the building. In the chancel is a slab of black marble said to be the tomb of Robert Pierrepont. The piscina has dogtooth and nailhead ornament. The church was badly restored in 1831-2, but properly restored in 1907 by Louis Ambler, architect, when the walls under the tower arch, the gallery and staircase were removed and an oak altar, pulpit and screen across the tower were added.